The Mints are the smallest fairies in Sugar Valley with perhaps the biggest job, especially in the winter months. The Marshmallow Run sledding competition is the highlight of the winter, but this year it’s Dash the Mint Fairy’s responsibility to make a new candy cane throne for Princess Lolli. But she is more interested in going marshmallow sledding. When Mogu the Sour Troll challenges her to a sledding race, the fate of the peppermint sticks hangs in the balance. Can Dash defeat the troll and complete the throne? A cool morning breeze blew through Marshmallow Marsh. Dash, the smallest Mint Fairy in Sugar Valley, was very excited. She had been working on her new sled all year, and now her work was done. Finally the sled was ready to ride. And just in time! Sledding season was about to begin. Many fairies in Sugar Valley didn’t like the cool months as much as Dash. Each season in Sugar Valley had its own special flavors and candies—and Dash loved them all. She was a small fairy with a large appetite! Dash was happiest during the winter. All the mint candies were grown in the chilly air that swept through Sugar Valley during the wintertime. She enjoyed the refreshing mint scents and the clean white powdered sugar. But for her, the thrill of competing was the sweetest part of the season. She had waited all year for this chance to try out her new sled! The Marshmallow Run was one of the brightest highlights of the winter for Dash. The sled race was one of the most competitive and challenging races in Sugar Valley. And for the past two years, Dash had won first place. But this year was different. This year Dash wanted to be the fastest fairy in the kingdom—and set a new speed record. No fairy had been able to beat Pep the Mint Fairy’s record in years. He had stopped racing now and was one of Princess Lolli’s closest advisers. But no one had come close to breaking his record. Dash had carefully picked the finest candy to make her sled the fastest. While many of her fairy friends had been playing in the fields, she had been hard at work. She was sure that the slick red licorice blades with iced tips and the cool peppermint seat was going to make her new sled ride perfectly. If she was going to break the record this year, she’d need all the help she could get. Dash looked around. No one else was on the slopes at this early hour. She took a deep breath. The conditions were perfect for her test run. “Here I go,” she said. On her new sled Dash glided down the powdered sugar trail that led into the white marshmallow peaks. It was a tricky and sticky course, but Dash had done the run so many times she knew every turn and dip of the lower part of the Frosted Mountains. She steered her sled easily and sped down the mountain. The iced tips on the sled’s blades made all the difference! She was picking up great speed as she neared the bottom of the slope. When she reached the finish line, she checked her watch. Had she done it? Had she beat the Candy Kingdom record? Dash couldn’t believe how close she was to beating her best time. She had to shave off a few more seconds to break the record, but this was the fastest run she had ever had. Dash grinned. This year is my year, she thought happily. Suddenly a sugar fly landed on her shoulder with a note. Dash recognized the neat handwriting of her friend Raina. 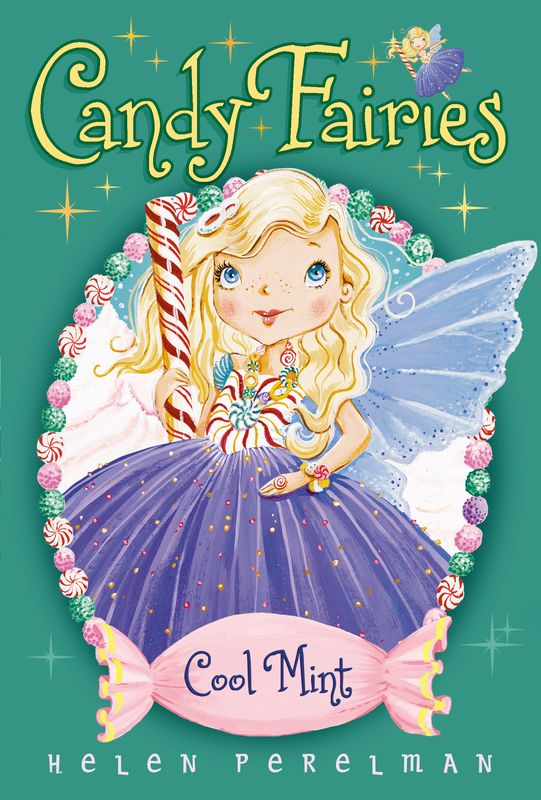 Raina was a Gummy Fairy and always followed the rules of the Fairy Code Book. She was a gentle and kind fairy who was also a very good friend. “Raina told you that you’d find me here, huh?” Dash said to the small fly. Dash opened Raina’s note. “She thinks she has to remind me about Sun Dip,” Dash said to the fly. She shook her head, smiling. Sun Dip was a time when all the fairies came together to talk about their day and share their candy. Dash loved the large feast of the day and enjoyed sharing treats with her friends. Now that the weather was turning colder, her mint candies were all coming up from the ground. Peppermint Grove was sprouting peppermint sticks and mint suckers for the winter season. Dash looked up and saw the sun was still high above the top of the mountains. She had time for a couple more runs. She was so close to beating the record. How could she stop now? “Tell Raina that I’ll be there as soon as I can,” Dash told the sugar fly. The tiny fly nodded. Then he flew off toward Gummy Forest to deliver the message. Flapping her wings, Dash flew back to the top of the slope with her new sled. She had to keep practicing. My friends will understand, she thought. As she reached the top of the slope, Dash could think about only one thing. Wouldn’t all the fairies be surprised when the smallest Mint Fairy beat the record? Dash couldn’t wait to see their faces! And to get the first-place prize! The sweet success of winning the Marshmallow Run was a large chocolate marshmallow trophy. It was truly a delicious way to mark the sweet victory of winning the race. With those happy, sweet thoughts in her head, Dash took off. Cool wind on her face felt great as she picked up speed down the mountain. A few more runs and she’d beat the record, sure as sugar. This year everyone would be talking about Dash—the fastest Mint Fairy ever!